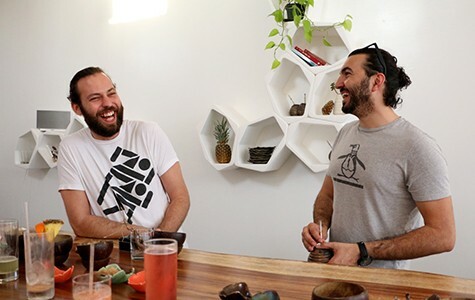 Nico Rivard (left) and Rami Kayali are the first to bring kava to the Bay Area. The first thing you may notice about MeloMelo (1701 University Ave., Berkeley) is the glow. Soft purple fades into blue-green, then orange, like a giant cube-shaped lava lamp. The interior has a kind of first-class space-shuttle-lounge-meets-Hawaii vibe: low, modular furniture (custom made in San Francisco), surf flicks projected on the walls, and a giant wooden bar that comes straight from the Big Island. On top of that, everyone is drinking out of coconut shells. But they're not sipping piña coladas, because MeloMelo doesn't serve alcohol. Instead they serve kava, a psychoactive South Pacific beverage made from the roots of Piper methysticum, a member of the pepper family. 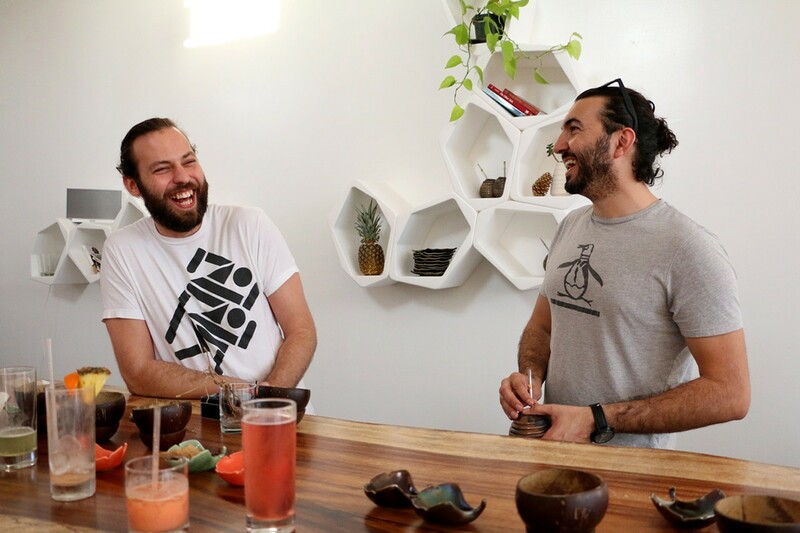 Owners Rami Kayali and Nico Rivard are the first to bring kava to the Bay Area from South Florida, where they stumbled upon it while high on San Pedro cactus. (When I asked Kayali how he and Rivard found out about kava, he asked, "Do you want the rated-R version or the PG-13 version?") Rivard said he was a stockbroker "for a minute," then realized that he hated it. Now Rivard spends his days gently massaging a fat, dirt-colored bag of ground kava. He starts by grinding a fifty-fifty mixture of lateral roots and stump — "If you use more of the lateral roots, you get more of a heady buzz," he said — then brews that with hot water, lets it cool, and tastes it. Running MeloMelo has got Rivard drinking a lot more of the stuff than he used to. "The beauty is the reverse tolerance," he said. "Sensitization," Kayali corrected. "You start salivating, you already know what's coming. I have the tolerance of a ten-year-old," Rivard giggled. "I sleep a lot better, my dreams are getting very colorful, like literally just bright colors." Kava is thought to have originated in Vanuatu, an archipelago west of Fiji that's home to the most kava varietals on the planet. The FDA classifies it as a "supplement," the label the government agency gives to things it doesn't want to regulate. Ethnobotanist Dale Pendell lists the plant under the category Pacifica, "the peacemakers." The kava plant cannot reproduce sexually, but growers can clone it for specific characteristics. In this case the characteristics are kavalactones, the chemicals responsible for kava's anti-anxiety, anesthetic, and sedative effects. Without any added flavorings, the beverage itself is disgusting. Intensely chalky, the flavor it comes closest to is mud (if you've ever accidentally gotten some clay mask in your mouth during a facial, you know what I'm talking about). It also numbs your mouth in a not-too-pleasant way. "I kind of feel like I just went to the dentist," my friend said. You drink kava like a shot, so you won't taste too much, and then shove a pineapple chaser in your mouth. "It's like the lime after a shot of tequila," Kayali and Rivard said to customers over and over. Still, Kayali and Rivard insist customers have their first kava straight up. "It's like your first time drinking coffee — you need to try it black first," Kayali said. Although I didn't enjoy the flavor of the traditional kava ($5), having the kava without flavorings is the only way to know what the kava itself tastes like, and the flavor is pretty unique. "We make you taste this first, but really kava can taste good," Rivard said. And he's almost right — the kava brewed with coconut milk ($7) is so much better than the water-brewed kava that I almost liked it. Once I tried the coconut brew and the mint-infused kava (which lacks the magic that happens when kava marries coconut), Kayali and Rivard gave me a Kava Koncoction ($7). The Koncoction I tried used kava concentrate instead of brewed roots. A bright coral syrup, the concentrate consisted of kava extract and lots and lots of sugar. It tasted like orange-flavored cough syrup. When blended with coconut milk and cinnamon, it passed for a fruity-sweet cocktail. "Honestly it's hard to make it taste good unless you use the extract," Rivard admitted. Another Koncoction — mango juice with coconut milk and a shot of kava — was good, too. Kayali explained that kava has been consumed ritualistically in the South Pacific for about 3,000 years. One tradition has men sitting in a circle grinding kava between their teeth, mellowing out together. "It makes you want to make friends," Kayali said. In that sense, the MeloMelo experience is not altogether unlike a mellower version of partiers downing Jell-O shots. My friend and I drank the kava together, coconut shells cupped with two hands. We raised the shells and yelled "Bula!" (literally, "life") before chugging the drink. Kayali and Rivard exchange knowing glances. "Whoa, that's a really strong batch," said Rivard "You're gonna get shell-faced." I didn't believe him, because after my first time trying kava I experienced no more than the gentle vibes of a cup of chamomile. But after about five kava drinks, I was feeling pretty buzzed — I couldn't stop smiling and nodding my head. The high lasted a few hours, and I told anyone who would listen, "I'm so shell-faced." Explaining what kava is after being met with blank stares is half the fun. "Are we bula-ing?" Kayali asked as Rivard poured a fresh shot. Rivard replied with a smile: "Yeah, I'm bula-ing." Tags: What the Fork, kava, Berkeley, Bula!